The Aguaymanto (Physalis peruviana L) is a shrub native to the Peruvian Andes, known as´native fruit´ since the time of the Incas. It was one of the preferred noble garden plants noble plants particularly were grown in the Sacred Valley of the Incas, this fruit was unveiled to the world in the eighteenth century, and remained as a delicacy in exclusive product stores. Its fruits are round and golden, protected by an inedible skin with a texture like paper, its small with a pleasant taste, which gives this fruit an inviting appearance in the market, along with its exquisite aroma, it has a sour and bitter taste peculiar tasty. This rustic Peruvian native fruit is an important part of the diet of the rural sector where it grows and spreads in the wild, especially in hot, dry areas near the Andes. Now cultivated outside of Peru with other names, where this plant has successfully proliferated: Quechua: Topotopo Aymara: Uchuba, cuchuva Spanish: mountain Guinda, aguaymanto, tomatillo, uvilla (Peru); capulí or bagging motojobobo (Bolivia); uchuva, uvilla, guchuba (Colombia); Cherry judas, topo-topo (Venezuela); uvilla (Ecuador); Cherry Peru (Mexico); other, love bag, cuchuva, beef tongue, sackbut, wild tomato, etc. 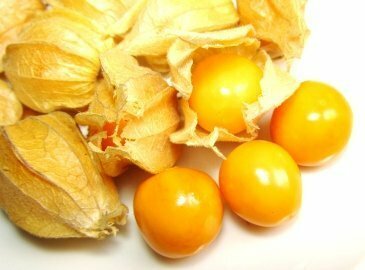 English: Golden berry, cape gooseberry, groundcherry giant, peruvian groundcherry, peruvian cherry (US), poha (Hawaii), fruit jam (India), physalis. The greatest wealth of aguaymanto lies in the abundant concentration of vitamins A, B and C, has form and flavor of a small plum, but a sharper flavor. 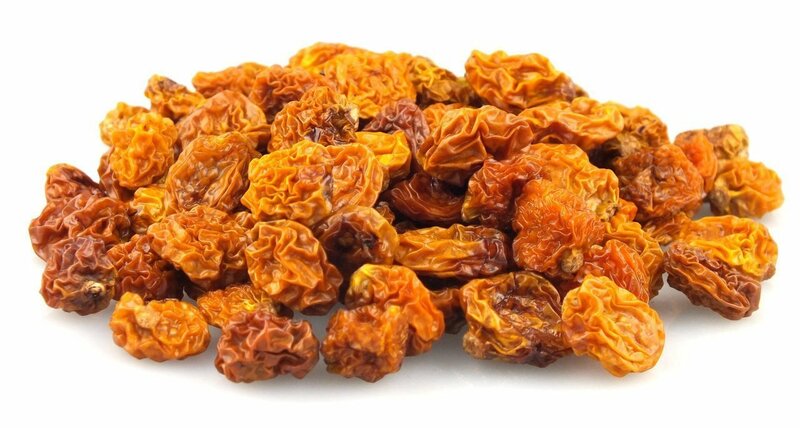 It is characterized as an excellent source of pro vitamin A (3,000 IU of carotene per 100 g) and vitamin C. It also contains vitamins B complex protein (0.3%) and phosphorus (55%). Currently, it has an important therapeutic use, as experts helps to purify the blood, tones the optic nerve and relieves oral and throat infections. It is recommended for people with diabetes of all types, favors the treatment of people with prostate problems thanks to its diuretic properties and is also used as a natural tranquilizer for its content of flavonoids, also serves to control amoebiasis. According to research by being digestive, helps prevent stomach cancer, colon and bowel. Calcium: Aids in the formation of teeth and bones. Mental Fatigue: Fight mental fatigue. Cholesterol: Lowers cholesterol levels in the blood. Diabetes: Eat the fruit of aguaymanto because it has an insulin-like substance. Injuries: Promotes healing of wounds. Menopause: Relieves symptoms characteristic of this period. Prostate favors treating people with prostate problems thanks to its diuretic properties. aguaymanto is a rich fruit found in vitamin A and C. Both vitamins are essential for the maintenance and good skin quality. Vitamin A helps with collagen conservation and freshness of the skin, as it is an antioxidant that fights free radicals thereof which are responsible for premature aging of the organism. Most women have problems with hemoglobin due to their irregular or heavy menstrual periods. The aguaymanto is an effective response in these cases, since it is a fruit rich in iron ore, which is responsible for contributing to the formation of red blood cell. The body is always exposed to multiple environmental attacks that cause various health problems such as fungi, blotchy skin, respiratory problems, colds, including the aguaymanto helps keep the immune system in good condition. In women many hormonal changes threaten the health of their bones and joints and the propensity to acquire bone diseases occurance is greater than in men. Often these diseases arise such as: arthritis, rheumatism, arthritis and often osteoporosis. The aguaymanto has calcifying properties that protect the bones of these degenerative diseases. It has energetic properties for the brain, due to its content of phosphorus and magnesium; both minerals help improve concentration and brain activity. Helps lower blood glucose levels, helping to prevent this disease and assists in better health. Habits like smoking, sudden changes in temperature and weather make organs like the lungs exposed to multiple diseases of the airways. The aguaymanto, with that delicious sweet and sour taste which is rich in vitamin C, another antioxidant responsible for maintaining the health of our lungs. The aguaymanto is excellent to clean, purify and detoxify the body. There have been no complications, except for consumptions restrictions for allergic to the compounds of aguaymanto. Excessive drinking is not recommended because of the degree of acidity that could cause stomach ache. In recent years, due to the expansion of alternative medicine, aguaymanto has been one of the favorite fruits to those skilled in the art. Although excessive Consumption is not recommended because, "aguaymanto or tomatillo field serves to help treat diabetes and other ailments as symptoms of menopause and counteracts aging." This fruit was underestimated, ignored and often underestimated. "In the country grew so wild on the slopes of the Peruvian Andes, and was the food of the poor; but now happily this was reversed and so it’s currently distributed in markets with great success, "
The aguaymanto is consumed in different ways: canned, like nectar, jam, yogurt, ice cream, extract, fresh, frozen pulp or as an ingredient in dishes of exquisite cuisine Novoandina flourishing. The goldenberry has different presentations according to their different processes, but has proven effective in each use.